Once again the beautiful St Nicolas Church in Guildford was the venue for our concert of Carols, festive songs and other music on Sunday December 10th. We followed our usual pattern of having a variety of music, with the seasonal pieces coming in the second half of the concert. The Chamber Choir began with three pieces in Latin, but despite that link, they were in very different st yles. Hassler’s Verbum Caro Factum Est is a lively setting of some words from John’s Gospel, and stands at the beginning of the transition from Renaissance polyphony to the highly ornamental baroque style of the 17th and 18th centuries. 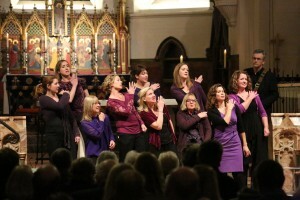 Charles Villiers Stanford’s Beati Quorum Via is a prime example of the nineteenth century Anglican Choral tradition with its rich, almost Romantic harmonies, and Ola Gjeilo’s Ubi Caritas is a modern setting of medieval Latin words, with an ethereal, poignant style. 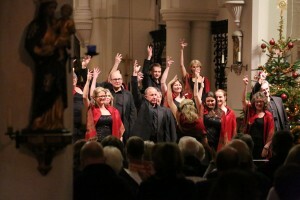 A number of audience members commented on the magical atmosphere as this was sung. After this the choir enjoyed revisiting the lush Spanish stylings of Eric Whitacre’s With a Lily in your hand. 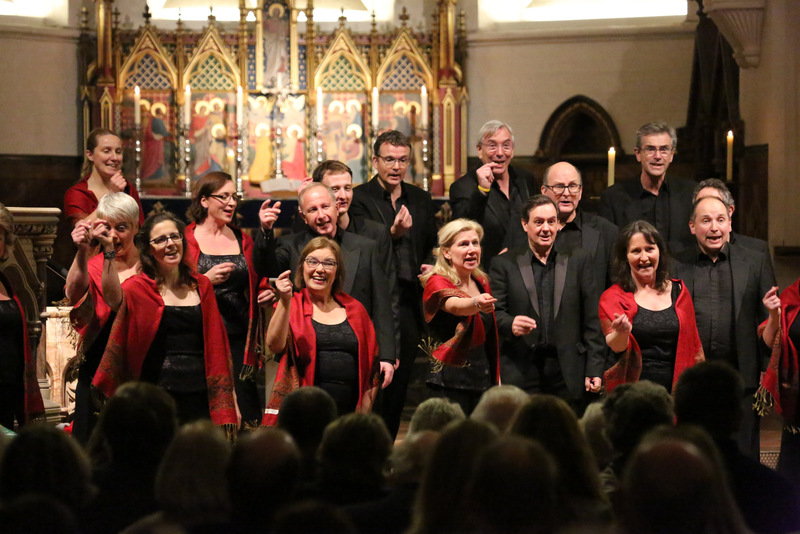 After this it was the turn of the Surrey Hills Singers, with Eve and Austrina’s lively Latvian dance setting of Laudamus in Domine, a visually and musically spectacular performances of a Japanese piece, Hotaru Koi, about a firefly, accompanied by twinkling lights. A lovely arrangement of the Skye Boat Song followed, showcasing the strength of solo voices in the Singers as well as the tight harmonies. 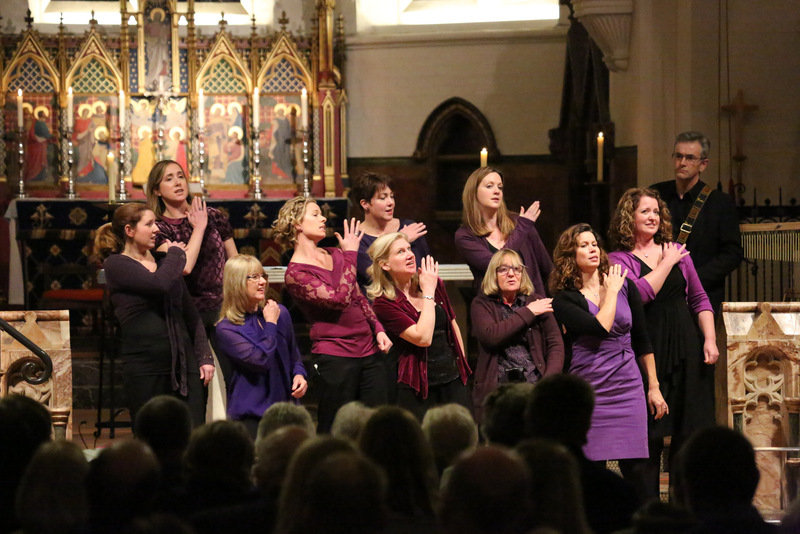 No Surrey Hills Singers performance would be complete without an excitingly choreographed modern piece, and Deke Sharon’s setting of Katy Perry’s Roar provided a rousing finale to the Singers’ first set. 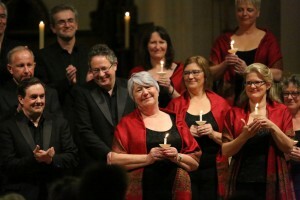 At our previous year’s Christmas concert, Christine Parrott had been unable to sing the alto solo for the air, O Thou That Tellest Good Tidings to Zion from Handel’s Messiah because of illness, so it was a great delight that she was able to give a beautiful performance of it this time, with several members of her family in the audience. Other audience members described her performance as ‘stunning’ and gorgeous’. This led into the chorus of the same name from the Chamber Choir. Our musical director, Debbie Walton, loves to use the concert spaces to full effect, so the Messiah pieces were followed by the ladies of both choirs surrounding the audience to sing Lyn Williams’ Festive Alleluia, with its bell-like four-part canon. The men of the Chamber Choir then sang a more light-hearted folk carol, the Catalan tune Fum, Fum, Fum with its rhythmic evocation of drumming. 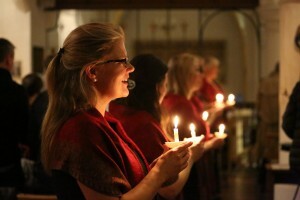 The Singers’ final set included a setting of the traditional Sans Day Carol, and a wonderfully judged performance of David Waggoner’s haunting fusion of Infant Holy and The First Noel, which he has set as Noel Fantasy. To round off their set we enjoyed Here Comes Santa Claus, complete with Santa hats. For the Chamber Choir’s final set, the choir moved to the sanctuary behind the altar for John Tavener’s tender setting of William Blake’s The Lamb. 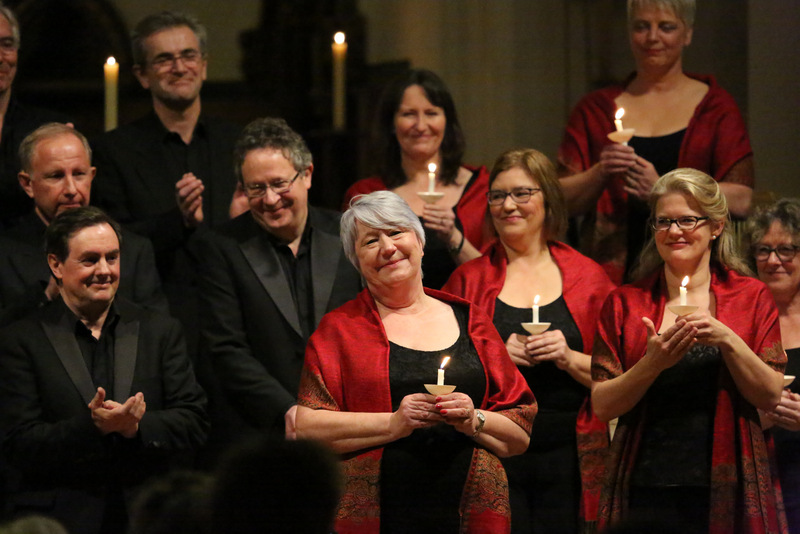 Then, as the choir moved forward Helen Evans, who has long sung with the Surrey Hills Singers but recently joined the Chamber Choir, sang the opening solo line of Mark Miller’s reverent setting of Dona Nobis Pacem. Despite only having those three words, this unfolds from the quiet solo opening through a number of moods ranging from the plaintive through the anguished to a final tender acceptance. 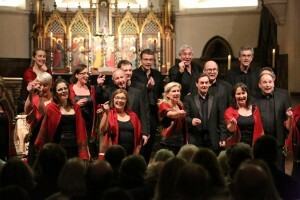 This was followed by Trotta’s setting of Veni, Veni Emmanuel, a familiar Advent Carol (O Come, O Come Emmanuel) but with Latin American rhythms, and Il Est Né Le Divin Enfant, before the choir sang a beautiful new carol by local husband and wife composers Alexander L’Estrange and Joanna Forbes L’Estrange. This is a heartfelt and challenging exploration of the significance of the Magi’s gifts of gold, frankincense and myrrh, suggesting the need in today’s world to bring a new gift of care for our fragile blue planet. Although not up to the Surrey Hills Singers’ standards, the Chamber Choir does occasionally include some choreography into its performances, and this was the case for Up on The Housetop, a lively, American evocation of children’s delight in Christmas, with the choir enthusiastically pointing around the roof of the church while exclaiming ‘Is that Santa Claus?’ while looking for the reindeer and inviting Santa to come on down the chimney. One audience member’s description of the choreography as ‘genius actions’ may have been a little over the top, but it was certainly a crowd-pleaser. 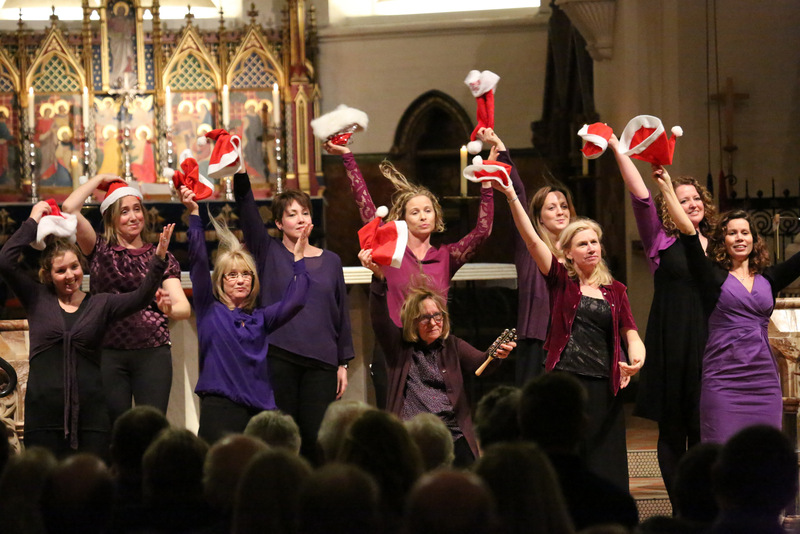 Although not originally programmed, the choirs were very keen to reprise the setting of Leonard Cohen’s Hallelujah that had gone down so well at our Saturday concert, so that was sung as an encore by both choirs, along with We Wish You A Merry Christmas. There were many enthusiastic comments from audience members about the concert as a whole, and as usual, many were able to join us for refreshments afterwards.